Pearl Jewelry has never been at the level that is now. 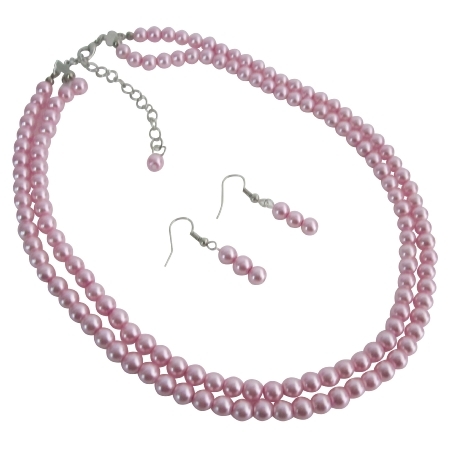 Wedding pink pearls double stranded necklace earrings set are more beautiful choices than ever before from all parts of the world. This necklace set is made with beautiful 6mm pink pearls double stranded necklace with dangling 3 pearls earrings nickel free & at the back of necklace extender has cute 1 pearl dangling absolutely gorgeous & rich complimentary colors that work magic as they delight the senses!. Customize Pearl Jewelry for BridesmaidBridal Flower Girl Maid of Honor Matron Of Honor Prom Wedding Gift Pearl Jewelry.